I got the idea for this recipe from my Mom and was reminded to use it when I saw this recipe this morning. This is a great way to use your left-over chili or you can make it from scratch like I did today. Whip up some chili. Mine is always different, depending on what's in the cupboard. 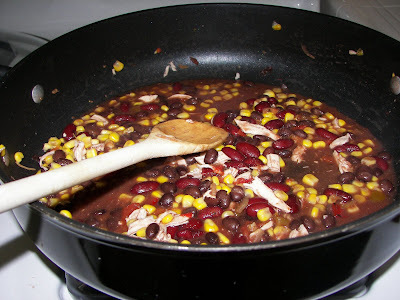 But, today I had kidney beans, black beans, a bag of corn, salsa and some cooked and shredded chicken. (And of course a little salt and pepper). We're not big fans of spicy food, so if you like things kicked up a bit you could add a can of green chilies or some Rotel or something. Pour the chili into a baking dish. I'm not sure what size this is, it's my "medium" one. Does that help? 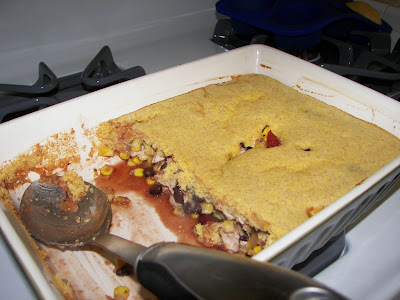 Then, mix up a batch of cornbread. I always use the recipe on the back of the cornmeal bag. It's super simple. 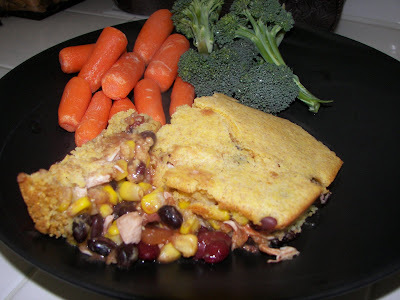 ****TIP*** Don't try substituting wheat flour for the white flour, it makes really grainy and dry cornbread. I use half and half sometimes, but all white flour really tastes the best. 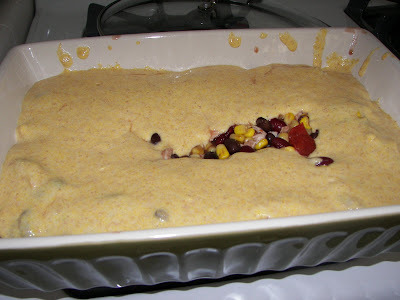 Pour the cornbread mix right on top of the chili. My mom's tip is to only put the cornmix on the outsides of the pan and leave the middle uncovered because it's hard to get it to cook all the way through. I tried to do this, but when I lifted the pan to put it in the oven, it just slid all over the casserole. Anyhow, it baked just fine...luckily! Bake it in the oven with no cover for about 20 minutes. After 20 minutes, mine was perfectly cooked though, no gooey-ness. If you like it a little gooey, then just take a few minutes of time off. 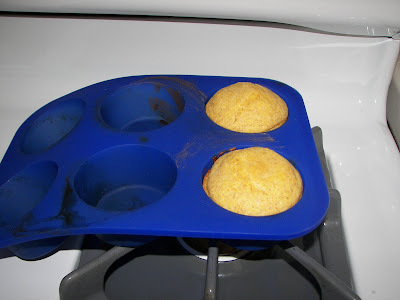 Oh, and there was a little extra cornmeal mix so I baked two muffins with the casserole. Yum-o! I'm tellin' ya sister, you need to try the cornbread recipe I posted two below. It's much better, and Gordon won't complain about missing the sweet because it has just enough.